Kerkyra, as the island is called in Greek or Corfu, is always worth a visit with a rental car. This is why the island is one of the three most popular in Greece. The island tells the story of the many different peoples who have left their buildings from different eras. Contrary to the history of the Greek mainland, however, there are buildings of the Romans, the English, the French and most recently also the Venetians, but a Turkish cut is missing here completely, as it is otherwise to be found everywhere else in Greece. For example, on a tour of Corfu you will quickly discover that Venetian impressions are predominant when you rent a car from Corfu, which was found at an affordable price using the Internet. The airport of Corfu CFU is located directly by the sea, the runway ends here at the sea. The arrival at the International Airport Ioannis Kapodistrias with one of the many flights will be a unique experience. The airport itself is small and everything is located in a small building. For information you can also visit a tourist information desk, there is a shop where you can get Pop Art and a small duty-free shop on departure. Corfu Airport handles international flights to European cities as well as domestic flights to Athens and Thessaloniki. Especially in summer there is a large number of passengers and waiting times at the pick-up point of the car rental company can also occur if you want to pick up your rental car, which you could previously rent at a low price via the Internet. Where can I find the Car Rental companies at Corfu Airport? This is how you can get to the Corfu CFU airport quickly to pick up your rental car. If you come from the baggage carousel through the airlock into the hall, you will also see a pick-up station of the car rental service, which is located here directly in the arrivals hall. Several large car rental companies, which can be found on the Internet at a low price and can be found directly in the arrivals hall at the airport of Corfu. Here you can pick up the key for the rental car, which is parked in front of Corfu airport in one of the car parks. For information about Corfu and the International Airport there is also a tourist desk. As you can see from the table, there is no motorway in Corfu. Since the whole of Corfu has remained very rural, you should always drive your car with a local car rental company. Tractors, donkey carriages or a herd of sheep after a curve on the road are not uncommon here. children up to 12 years of age or less than 1.35 meters need a suitable child seat and are not allowed to sit in the front. If children are travelling with you, you should already inform them if you rent your car cheaply via the Internet, so that the car rental company can provide you with the required seats when you pick them up at the pick-up station. Here you can refuel your car at the airport pick-up station. Even if you pick up your car at the pick-up station of the car rental company at the International Airport Ioannis Kapodistrias Corfu (Kerkyra) CFU without much fuel in the tank, this is no reason to worry. Here, in the immediate vicinity of Corfu City, there is a petrol station at almost every corner. Also many of which are open until late in the evening and early in the morning. This way, you have the possibility to fill up your vehicle at any time, which you could rent cheaply via the price comparison on the Internet, and so you can also come to the more distant booked holiday accommodation. Check with the car hire company's pick-up station to find out in advance whether the car you rented is a petrol or diesel car. Petrol is offered here with 95 octane or 100 octane, diesel for the car is also called Gazoil in Greece. If you have landed at the International Airport Ioannis Kapodistrias CUF in Corfu, you can start your rental car of a local car rental company directly from here on a tour of the beautiful island. Besides the lively capital city of Corfu with its interesting old town, the second largest of the Ionian islands has much more to offer. If you have been able to find and rent a car cheaply via the price comparison, then you can pick it up at the pick-up station of the local car rental company at the airport, so that you can start directly. 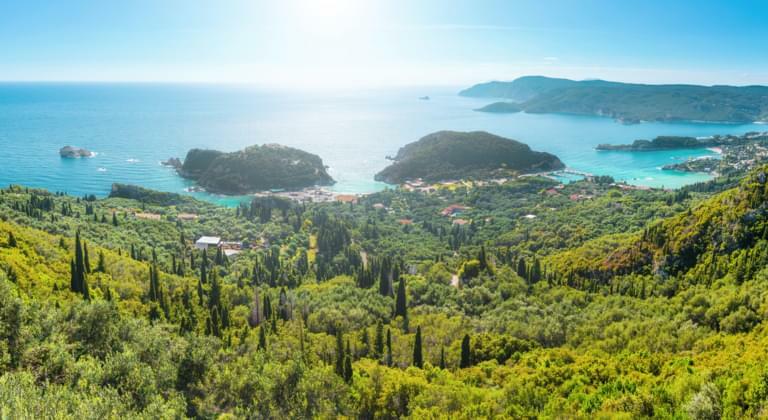 Especially small, dreamlike bays, white sandy beaches and picturesque mountain villages can be discovered on Corfu. With the rental car you drive through olive groves over the green hills of the island until the road after a curve offers the view of the open sea. Since the roads are often narrow, if it is not the main roads, a manoeuvrable small car lends itself for the round trip as a rented car. Of course, a visit to the Achillion, the castle of the Austrian Empress Sissi, is also an absolute must on your round trip with a rental car. Corfu CFU Airport is only a few minutes away from the historic old town by rental car. You can reach the Old Town quickly by car, which you could book in advance via the online price comparison service and which you can obtain at the airport car hire collection point. Since the core consists of pedestrian passages, it makes sense to park the rented car in one of the free parking spaces at the harbour and explore the streets on foot. Since everything is close together, this shouldn't be a problem. The old town of Corfu offers you small narrow alleys in which the laundry is stretched from house to house, as is often the case in Italy. The Venetian as well as the French influence can be found everywhere, for example on the Liston, which is popular with many music students and where the café is lined up with café. In addition, Corfu is guarded by two fortresses on each side, the old fortress and the new fortress, with only about 30 years between the years of construction. These can also be visited, in the Old Fortress there is a music university of Greece.